I’ve tried Ecto for Windows a few times in the past, however, I never stuck with it long enough to give it a proper review simply because I couldn’t get used to it in the least. It seemed unintuitive and came with a steeper learning curve than I was willing to commit to. However, it’s gone through a few versions and has come a long way since my original download. Ecto for Windows 2.3, with a price tag of only $17.95, is similar in many ways to BlogJet, however, it does take some getting used to. 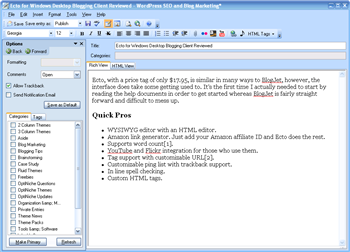 WYSIWYG editor with an HTML editor. YouTube and Flickr integration for those who use them. Tag support with customizable URL so you can link internally as opposed to Technorati. Customizable ping list with trackback support. In line spell checking. See any errors as you type and right clicking on the word will bring up a number of alternatives (or you can choose to add it to the dictionary). Custom HTML tags. From the main blog management screen, you can define an array of various HTML elements that may not be available with the traditional buttons/menu items, which can be added to the entry without needing to switch to code view for manual insertion. File/image uploader with thumbnail support. It makes adding files (i.e. PDFs, documents, text, MP3s, etc.) to a blog entry super easy and will even hyperlink them for you. Blog/post manager which shows you, at a glance, which posts you have waiting in draft. Auto-save. Anyone who’s ever written an exceptionally long blog entry, then had the computer die or accidentally shut down the application before saving can appreciate this feature. You can set it up to save as often as you like (default is 2 minutes). No FTP support. Uploading happens via the XMLRPC upload. HTML editor can use some work. Blocks of code get lumped together where logical line breaks would make the most sense. When adding code, hitting the return keys adds an inordinate amount of space between lines which may throw a user off at first. Finally, the in line spell check is activated so it appears that all the HTML code is erroneous. No way to strip paragraph tags before publishing. No offline editing mode. Although you can write and save an entry locally without an internet connection, if you disable it (which I had to do because of the synchronization issue), it would throw up error messages every few seconds stating that the server could not be found. Blog synchronization can’t be disabled. Upon launch, it synchronizes itself with the blog and downloads the 10 most recent entries whether you want it to or not. Setting the number of entries to receive to zero means it will download every entry every published on the blog. My only recourse was to set it to 1 (and it took a few tries for it to accept that and go with the flow). Deleting an entry from blog manager window deletes it from the blog with no way to delete it only from the blog editor window. Display settings aren’t saved on exit. After finally getting the toolbars and window pains situated as I liked, upon closing and re-opening the application, I realized that they weren’t saved and I had to set everything up to my liking all over again. Borks previously published WordPress entries. This is because WordPress does not save posts authored in the admin panel with paragraph tags, therefore, when Ecto downloads them for editing, it lumps the content into one giant paragraph. Inserts clipboard content when adding a hyperlink. In some cases, this is a time saver, however, after someone has copied a large block of text and unknowingly clicks on the add hyperlink button, she is then presented with the longest run-on sentence ever. Using Ctrl+A to select it all/delete it doesn’t work either. The entire block needs to be manually selected/deleted before the proper hyperlink can be added. Cannot publish an entry as draft. Sometimes bloggers like to upload their entries in draft mode to work on from a different computer, however, Ecto for Windows doesn’t provide that option. It only has the option of saving the file locally as a draft, however, the moment you hit publish, it’s live to the world. Quick view of the word count. In its current form, you would need to click on View->Word Count in order to see the total number of words. Being able to see the word count quickly while typing is always a plus. Excerpt field integrated with the posting screen. To add an excerpt, you would need to type an awkward shortcut key combination or click on Edit->Keywords/Excerpt and then a pop up would appear for you to type in. Being able to quickly view the excerpt as part of the post (possibly under or above the content, or even in another tab) would make blogging a bit more productive. Color coded HTML with some spacing. The beauty of HTML is that you can throw as much whitespace as you want in between tags to aid in readability. Currently, it’s a chore needing to scan through the HTML to find a particular area of the post. Color coding with line breaks could make it much easier. Using Ecto did not seem organic, as using a desktop blog editor should. Instead, I felt as though the blog editor was using me as opposed to me using it. As a user, there are certain elements which I should have absolute control over: whether to work online or off, whether to download the recent entries/synchronize with the blog, and whether I can upload files via FTP or XMLRPC. The lack of some flexibility in the software, coupled with its strange learning curve (I found myself consulting the user manual more often than not), knocked it out of my top 5 list of desktop blogging clients despite doing so many things right. However, for the price, it is definitely a good value if you’re willing to invest the time necessary to master it and are willing to overlook the shortcomings. Truth be told, the average blogger may not need to worry about some of the shortcomings at all. There is a free 21 day trial, so download it and play with it for yourself. Make sure to set up a blog and post an entry in your usual style to see if it’s a match. Notice: I was not actually able to publish this post with Ecto for Windows. Instead, I had to copy the HTML code and paste it into the post screen of my blog. When I decided to publish the entry, Ecto had other ideas — it wanted to upload files when there were no files to upload. So, after about five minutes of watching the task meter ticking along with the “Uploading files” message, I decided to close it down, re-open it and try again with no luck. So, that takes Ecto for Windows completely out of the running. 1: Though you can change the tagging URL, this is not on a per blog basis, so you cannot customize internal links for your individual blogs. 2: In line spell checking is great, but not so great in HTML view; all the red squiggles everywhere could throw a person off. 3: The custom HTML tags are certainly a time saver, but it can be sketchy for certain elements — for instance, <h3> tags were constantly wrapped in paragraph tags. 4: Adding an image may seem a bit unintuitive at first, but the image manager pops up once an image is selected. Also, when adding a file other than an image file, it will not give you an option to provide the anchor text for the link, it will just use the file name. I was planning to persuade someone to modify one of the clients to start working with the hacked xmlrpc for UTW users to make my life easier but with things up in the air about tagging currently, that seems a little bit of a risk. For real blogs I need to have access to my list of existing tags, and the ability to add tags, and I don’t have a solution for it. To be honest, Andy, I don’t really have a top 5. It’s more of a top 3 and, as it stands, those are BlogDesk, w.bloggar (an oldie, but still a goodie), and BlogJet. Right now, I use BlogDesk more than any other, but I think if Dmitry put a little extras into BlogJet, it would be a clear winner. One thing I do love about Dmitry/BlogJet, though, is the responsiveness. He’s quick to listen to his users and help them whenever possible. You should check out Windows Live Writer too. Open Office 2.3 with its blogging add-on has become my latest off line editor. I used w::bloggar from its outset. This was replaced with Performancing, (now ScribeFire.) Ecto was just too unfriendly in comparison to the others. I have not tried BlogJet, but have that tab already open in my Firefox. Thanks.